The majority of Latino voters believe women should have the right to make their own decisions about having a abortion even if they do not agree themselves, according to a poll released Monday. The poll was commissioned by the National Latina Institute for Reproductive Health, a group that advocates for women's reproductive rights, including abortion rights. It surveyed more than 1,000 Latino voters and found that 78 percent agree with this statement: “each woman should have the right to make her own decision on abortion, even if I may disagree with her reasons.” The vast majority of Latino voters also agree that politicians should not interfere with a woman’s decision to have an abortion. “I think what this poll shows is what we’ve known all along, which is that Latinos are actually overwhelmingly supportive of women decision making and don’t want to see politicians interfering with a woman’s ability to get abortion care,” Jessica González-Rojas, executive director for the National Latina Institute for Reproductive Health, said in an interview with NBC News. González-Rojas’ group commissioned the nonpartisan research firm PerryUndem Research/Communication to conduct the poll, which has a margin of error of 5.1 percent. Participants were asked questions in both English and Spanish. The poll findings also show 67 percent of Latino voters do not want to see Roe v. Wade overturned, and 69 percent agree that every woman should have health care coverage for the full range of pregnancy-related care - including abortion. When asked if they would support a close friend or family member who had an abortion, the vast majority said they would and only 15 percent said they would provide little or no support. The majority of Latino voters surveyed in English said they could imagine a situation where abortion could be the right choice for them, while the majority of those surveyed in Spanish said they could not. In addition, 69 percent of Latino voters said they believe abortion should remain legal regardless of whether church leaders oppose it. RELATED: What Does Planned Parenthood Funding Debate Have to Do With Latinas? González-Rojas said support for abortion among Latinos increases as they become more aware of the efforts by politicians at the state level to make it more difficult for women to have an abortion. The poll finds that most Latinos, especially those who were surveyed in Spanish, still aren’t aware of the state laws restricting abortion access that have been passed over the laws few years. When they learned about the laws, however, 65 percent of the Latino voters surveyed said they thought the state laws were a step in the wrong direction. 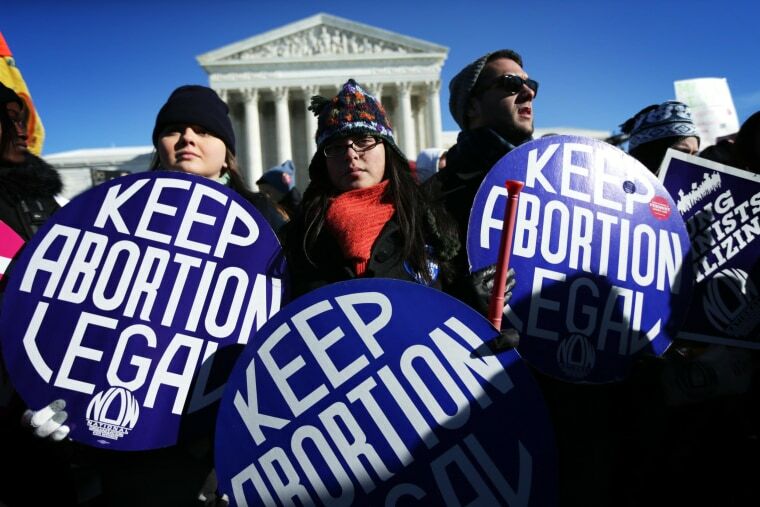 The release of the poll findings comes days before the U.S. Supreme Court hears oral arguments in a case, Whole Woman's Health v. Hellerstedt, that will determine whether an abortion law in Texas should be struck down. The Texas law requires doctors to obtain admitting privileges at local hospitals within 30 miles of the clinic where they perform abortions and also requires clinics offering abortion to meet some of the same standards as ambulatory surgical centers, essentially becoming mini-hospitals. These are the two provisions of the law that will be challenged during oral arguments on Wednesday. Prior to the law passing in 2013, more than 40 clinics across Texas were providing abortions. As of late last year, that number dropped to 19 and more could close depending on how the Supreme Court rules on the case. The poll findings also come two months into an election year. González-Rojas noted that 82 percent of Latino voters surveyed said they plan to pay attention to a candidate’s views on abortion after they learned about state laws that are passing to restrict access to abortions. Prior to that, 69 percent said they tend to pay attention to a candidate’s views on the issue. “As we head into a major election year and the Supreme Court hearing, the voices of the Latino electorate need to be heard,” González-Rojas said.